I’ve always wanted to paint my front door red. That was the first thing I promised myself I would do once I owned my own place. I’ve literally been pinning door painting tutorials for years in anticipation, and finally after being in the new house for six months all my dreams are coming true! Except… picking a paint color is a difficult task… like pretty much impossible. So I went to the hardware store and picked up a million color sample papers and taped them all over my front door… and decided that red was the color for me. Definitely red, because as much as I love turquoise it wasn’t quite working, and yellow was a little too much. It took weeks to decide, and the papers remained taped and countless innocents were harassed for honest opinions… a winner was picked and that winner was red. 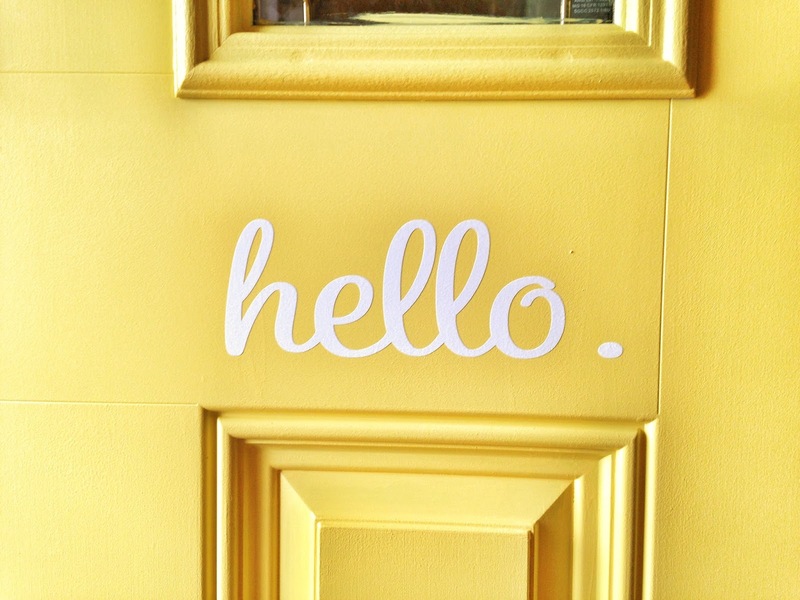 Then I went to the hardware store and saw the most amazing yellow… and bought a pint… and painted both front doors before I could even question my current life decision. You know what? It turned out amazing! I mean, I wouldn’t look super close at the lines if I were you, and it could probably use one more good coat (I feel like every paint job always needs one more coat than I have the patience to give). I would say it is not only good, it is good enough… and isn’t that the point of DIY? I figure everyone’s DIY is kind of crappy if you look close enough… it’s just that some people are photographing it better and have superior lighting. I added a vinyl sticker to the front door, also a dream fulfilled. So pinterest it hurts. My favorite thing about the new front is getting to tell people things like “We’re the third house on the right, the one with the yellow door”. I basically have the Mt Rushmore of front doors on our street YOU CAN NOT MISS IT. My other favorite thing about the front door… it’s a nice backdrop for serious cuteness.